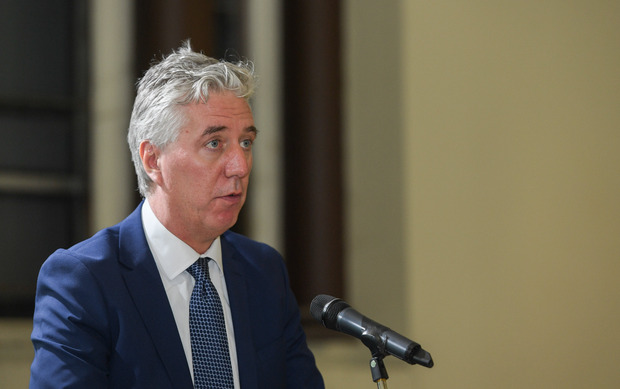 The FAI are facing fresh examination of their finances after the association admitted over the weekend that they received a €100,000 loan from CEO John Delaney. But Delaney has insisted that he "acted in the best interests of the association" by making the loan, which was needed "to aid a very short-term cash flow issue" at the organisation in 2017. The FAI issued a statement late on Saturday, confirming that Delaney "provided the FAI with a €100,000 bridging loan in April 2017", a loan which was repaid in June of that year. The loan "was required to aid cash flow", the association stated. The FAI also stated that Delaney has "donated back to the FAI" his UEFA remuneration, due to the Waterford native from his role on the UEFA Executive Committee and said to be worth €160,000 a year. A further statement was issued last night, just before the FAI’s annual awards night at RTÉ, where Delaney defended his actions in making the transaction. "I acted in the best interests of the Association at a time when immediate funding was needed. This loan had no impact on the full financial position or performance of the Association for the year. It was a matter of timing," Delaney said in the statement. "As CEO, I hold regular meetings with our Director of Finance regarding the state of our finances and all items arising are conveyed to our Board at our monthly meetings." Delaney is due to appear before an Oireachtas committee on transport, tourism and sport, on April 10. Figures provided by Social Democrats TD Catherine Murphy show that, since 2008 the FAI has received total State funding of €49.448million. 1. Why did John Delaney seek an injunction to prevent publication of a story about the €100,000 "short-term bridging" loan in a Sunday newspaper, and why was the injunction sought a full 14 days after the Sunday Times presented a list of questions on the matter to Delaney and the FAI? 2. Who paid the legal costs of a Saturday evening injunction application on a Bank Holiday weekend? 3. Why is there no mention of the April 2017 bridging loan of €100,000 in the audited accounts presented in 2018? 4. What were the exact circumstances of the FAI’s finances in April when the loan was, in the association’s own words, "required to aid cash flow" at the FAI? 5. Is the timing of the April 2017 loan to the FAI from John Delaney related to the fact that a highly publicised deal was concluded to end a dispute with the players from the Women’s National Team at that time? 6. Last summer, the then Finance Director of the FAI, Eamonn Breen, told the media that the FAI had "a soft loan of €4m" from UEFA, and now we learn of the €100,000 loan to the association from John Delaney’s own personal account; what other loans have the FAI received? 7. John Delaney told the media in August 2018 that the €4m UEFA "soft loan" would "absolutely" be repaid by 2020; what is the current size of that loan and what payments have been made to UEFA towards clearing it? 8. At a media briefing before the AGM in August 2018, when the accounts for 2017 were presented, the then Finance Director of the FAI, Eamonn Breen, stated that, outside of debt on the Aviva Stadium, the only liabilities that the FAI had were "business trading". He described them as "just normal, speaking from other businesses I have worked in, they are relatively normal: hotels, travel, the normal cost of operating business. That has been relatively stable over the last number of years, what is reported each year." While the loaned money was paid back fully in 2017, is a loan from an employee to an employer seen as "normal"? 9. What progress have the FAI made on restoration of pay levels to employees who took pay cuts during the recession? 10. In July 2018, John Delaney told the media that "it’s within our capacity next year to be debt free by 2020". Does the FAI board stand over that claim?